I know I’m supposed to be your guilty pleasure goddess, right? And at this point you rely on me as something of an immoral compass – as long as I continue to go off the guilty pleasure deep end, you can rationalize your own guilty pleasures, right? Because I have a confession to make. DON’T LIKE IT! I’m sorry! I know. What’s wrong with me?? It just sits in my DVR, taunting me. Is it the terrible acting on the part of the male lead (the teen wolf)? Does it take itself too seriously? Or is it just that Buffy (my all-time favorite show ever ever ever) set the bar too high? 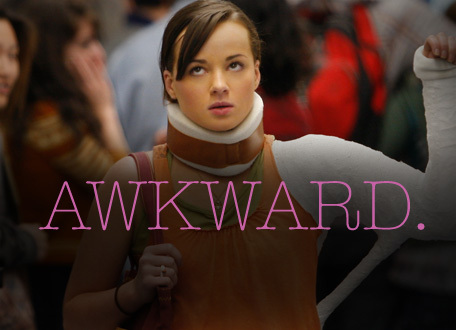 On the flip side, I LOVE MTV’s other new summer show, Awkward. It fills a little bit of the hole My Life as Liz and My So-Called Life left behind. The one negative is that it’s only 30 minutes long. What do you guys think? Should I be dethroned? Previous postINCOMING!! Conversation Bombs – Part TWO! Naw! Sometimes there are shows/movies/books that hover just in the wrong place between enjoyably bad and just bad. It seems like a trend in these things is that they take themselves too seriously. Is there much humor in Teen Wolf? If so, does it work? If there’s a dose of humor (preferably involving a little self-mocking), I’m much less apt to mock. You’re so right! There’s a small amount of humor (thanks to the one person on the show worth watching, the teen wolf’s best friend, Stiles), but it just doesn’t make up for all of the other shortcomings. No, I didn’t read the entry – but I’m definitely going to! Buffy is magical. Even (especially?) the musical episode. It’s the only show where I own every season on DVD. It’s going to be pretty tough to beat Oz, from Buffy, as far as cool werewolves of any age. Buffy rules. Teen Wolf is not good. Bad acting, bad effects. Tired plot line. My 13 year old and 15 year old love it though. Yay! Another Buffy fan! I’m so glad everyone is validating my opinion, haha I was wondering if Teen Wolf was hitting the mark with the younger crowd! Purely because of the perceived hotness of the boy actors. Which I don’t perceive. Yeah, the lead actor (Tyler Posey) on Teen Wolf can’t act so superb. He’s always grunting. Eeek.